Projects that support a newsletter will show an extra newsletter entry in the project overview. It can be opened by clicking on the arrow to display a list of existing newsletters, where you can edit, add, publish or delete newsletters. By click on Edit you go the edit view of the newsletter. There are fields for the title and the subject of the newsletter. Below these there is a list of news entries. The upper list contains all news entries that haven't been used in any newsletter. The bottom list contains all news entries that where already included in other newsletters. By activating a news entry you can add them to the current newsletter. The preview on the right shows how the newsletter will look. There is also a field for the description of the newsletter. This description is not visible in the newsletter but gets invisibly included in the description meta tag of the HTML version of the newsletter. The list Default contains all recipients, that subscribed to the newsletter through the website. The list Test is an internal group, that you can use to test the newsletter before sending it to the default list. Custom Recipients lets you add custom emails to send it to for testing purposes. You add emails as a comma separated list of emails. 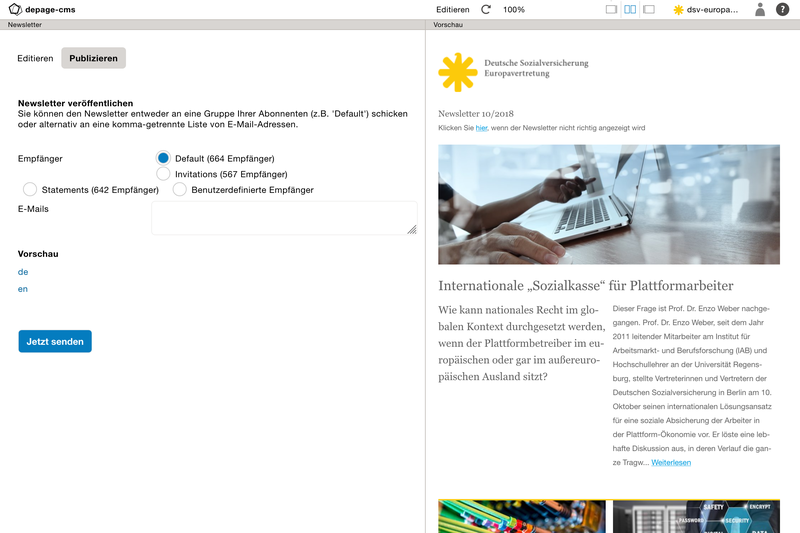 Preview lets you check all language versions of the newsletter. It is important to check both language versions before sending. 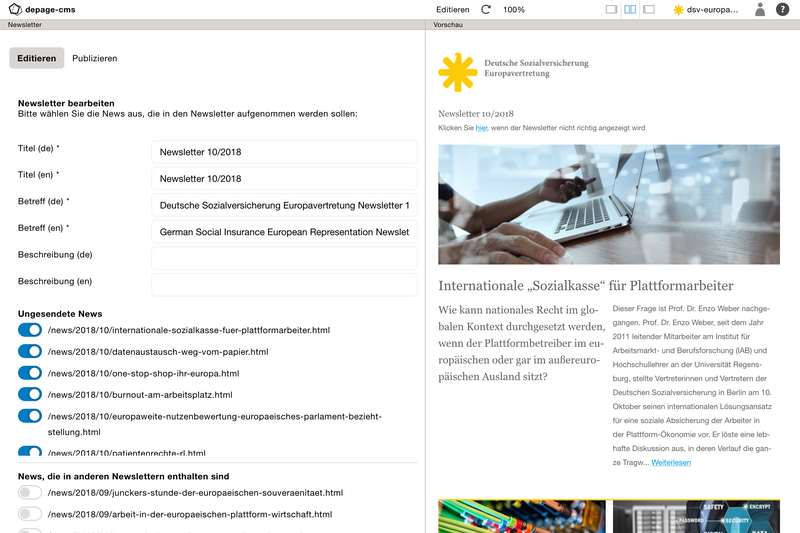 Send Now publishes the fallback HTML version of the newsletter on the website first. Afterwards it will send the newsletter to the chosen group of recipients.